Help A Child Smile dental bus has made it easy and convenient for parents to help keep your students’ teeth healthy. You can now sign up online for your student to be seen by a state licensed dentist @ www.myschooldentist.com. Dental insurance, Medicaid and cash are accepted. By doing so, a state licensed dentist will regularly check your child's mouth & teeth, as well as provide a cleaning, x-rays as necessary, fluoride treatment and apply sealants, as needed. Additional care, such as fillings, may also be provided. A dental report card will be sent home with your child. By completing this, the dentist will be able to see your child for their initial visit as well as all follow-up visits. This is all done while your child is at school! How easy and convenient for you and your child! 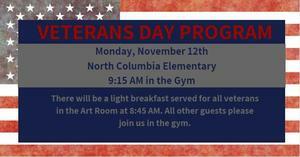 We Hope to “Sea” you there! 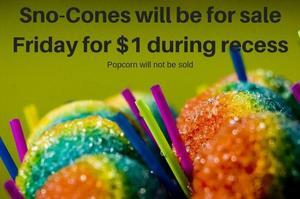 Sno-Cones will be on sale this Friday for $1. Popcorn will not be sold.